Earlier this week, our CEO Howard Nosckowicz, had the pleasure of traveling to Scottsdale, Arizona to attend the StorePoint Fresh show and present the new and innovative products that Excellence Industries has to offer. 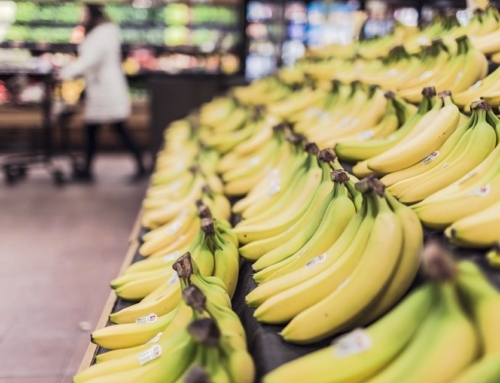 For those that may not be familiar, StorePoint Retail is an executive level Event for specialty and big-box chains to connect with Suppliers to innovate the shopping experience. We are grateful to Howard for representing us and look forward to continuing the relationships we were able to form while at the show. Howard presenting Excellence Industries in a board room to 7-10 supermarket execs. The last Saturday in Tampa always marks the annual Gasparilla Pirate Festival and Parade. The Gasparilla Pirate Festival is a large parade and a host of related community events held here almost every year since 1904. 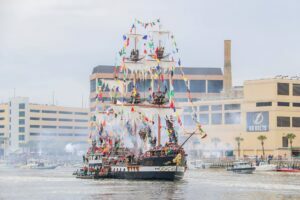 The events celebrate the apocryphal legend of José Gaspar (also known as Gasparilla), a mythical Spanish pirate who supposedly operated in Southwest Florida in the early 1800s. The event that takes place on the last Saturday of the month is marked by a flotilla of boats coming in through the bay to arrive at the convention center and “take over” the city. There is also a parade down Bayshore Boulevard, home of the longest continuous sidewalk in the world. 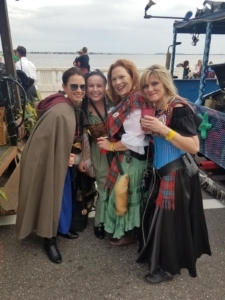 Many of our staff participate in the events and dress up in theme to board the pirate ship or join a float for the parade. 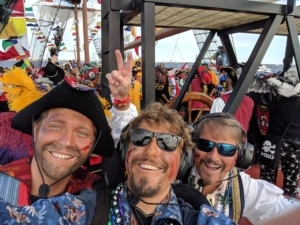 Pictured right, President Dell Dahl on the Gasparilla pirate ship with 2 of his nephews. The Gasparilla Pirate Ship approaching Downtown Tampa. Excellence employee Denise Alexander and some of her Krewe. 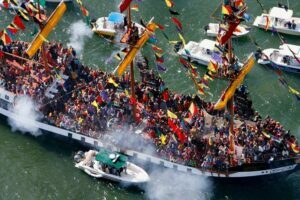 A birds eye view of the pirate ship coming into Downtown Tampa! 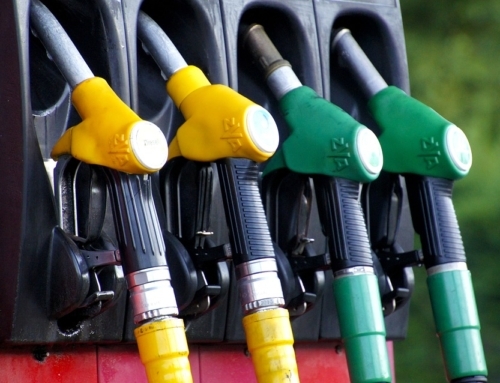 One of the things we strive for is to provide the most excellent customer service possible. If you’ve ever had the opportunity to interact with our CSR team you know we are always here to help. We recognized that the questions we receive, oftentimes, are similar and nature and wanted to find a way to help our customers find the answer to their questions quicker. 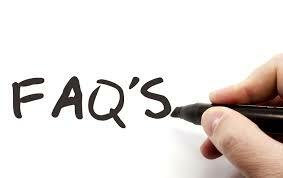 As a team, we compiled a list of some of the most frequent questions we receive as a team and placed them with answers on our FAQ page which you can find here. Have a question you don’t see or one you’d like to add? Feel free to email our marketing director at melissa@excellenceindustries.com and she will be glad to help! In her spare time, you can find her enjoying many different things around the Tampa and Orlando area. 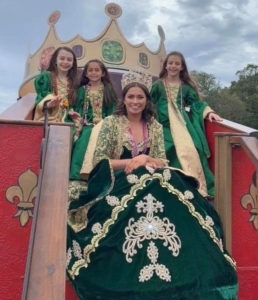 She is a member of a group of professional women who support local charities called the Krewe of St Brigit. She along with her Krewe are participants in the world-famous Gasparilla Parade of Pirates that takes place every year. Denise is a wine club member and enjoys time with friends traveling and tasting the newest Cabernet or Pinot Noir. When that isn’t enough to keep her busy, she’s likely in nearby Orlando with family, going to Disney or riding jet skis to the lakefront front restaurant to meet my Mom for lunch. 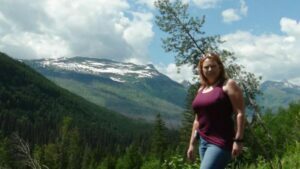 Denise pictured hiking in Montana at Logan’s Pass. 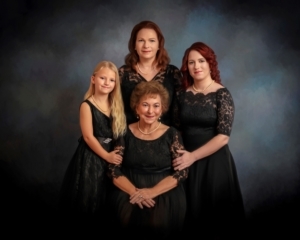 Denise, back center, pictured with 4 generations of women in her family. From left to right: Granddaughter Kayleigh, Mother Joan Pyle, and daughter, Rachael Alexander.